We are Atlantic Cruising Yachts, the largest, worldwide Fountaine Pajot Dealer and largest North American Jeanneau Dealer. 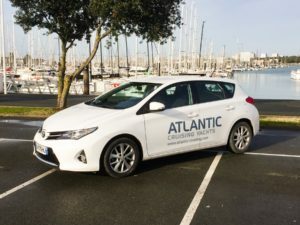 From our streamlined commissioning process with staff on the ground in La Rochelle to priority pricing for our clients, we are making the dream of ownership a reality sooner and smoother. Two Saona 47s and an Astrea 42 loading on a ship in Southampton UK. This ship will drop one of the Saona 47s off at the Annapolis Spring Sailboat Show and then head to Palm Beach to place the other Saona 47 and Astrea 42. A Saona 47 and Saba 50 just left La Rochelle and are sailing to Annapolis. A Saona 47 is sailing to the British Virgin Islands. An MY 44 that just arrived in Palm Beach and is making her way to Ft. Lauderdale for local commissioning. An MY44 and MY 37 will start commissioning in La Rochelle and then will be loaded in Southampton UK. This ship will drop the MY37 in Baltimore and then sail to Florida. We pride ourselves on providing our clients with highly personalized buying experiences at each stage of the ownership process. The above list of in-progress yachts is just a few examples of different models and stages we are walking our clients through. We are fortunate to have such incredible clients who have great things to say about their experience with us – feel free to explore our client testimonials. Purchasing a yacht requires a decent amount of research. Each buyer has specific, personal and logistical requirements for their yacht based on their sailing or motor experience. Working with a trusted yacht company, such as Atlantic Cruising Yachts, is the best way to ensure a smooth and enjoyable buying experience. For Jake and Nancy Jacobson, their journey to new yacht ownership with us began in 2014. The Jacobsons met our team during the Annapolis Boat Show and from there decided to attend one of our Open House events. They ultimately decided to partner with us for their purchase because of our “supporting services and product”. 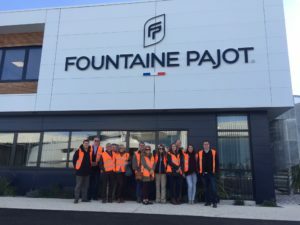 Purchasing a new Fountaine Pajot catamaran can be a highly complex project requiring orchestration of diverse groups and interests including the factory and its personnel, foreign contractors, shipwrights and suppliers, delivery crew, cargo shippers, insurers, lenders and governmental authorities. 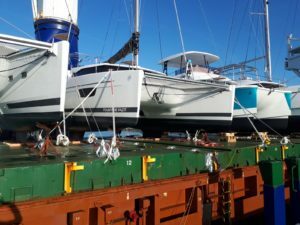 Our Commissioning Project Coordinator role is unique in the yacht industry, and allows us to better serve new Fountaine Pajot owners through this complex process of build, commissioning, delivery, and final handover. Working on the ground in La Rochelle, France, the Commissioning Project Coordinator helps facilitate timely and effective communication between the factory, our French contractors and suppliers, our North American support teams, and of course our clients. Whether you’re seeking an updated timeline, photos of your new hull, or a guided tour through the factory, he makes the process simpler than ever by acting as your direct liaison. 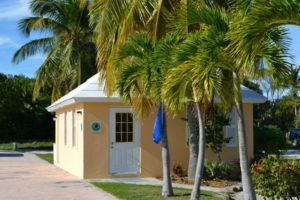 As a particularly frigid winter in North America gives way to spring, people are planning summer vacations to tropical places such as The Abacos, Bahamas. This 120 miles-long chain of islands are home to some of the world’s most beautiful beaches, quaint anchorages, and exceptional leisure activities. As the Boating Capital of the World, the islands are the perfect location for placing your new yacht into charter! When Is The Best Time To Order My Catamaran? Question #1: When Do You Want Your Yacht? You have the desire and the budget for a magnificent flagship yacht from Fountaine Pajot, but are still interested in pursuing the most fiscally advantageous approach. The Crewed Yacht Charter Business Program might be for you. It is a unique opportunity to enjoy all the benefits of the luxury yacht lifestyle. The Crewed Yacht Charter Business Program implements your yacht as a business, making it a tax-deductible business asset. With the potential to offset 80-100% of costs with income and tax advantages, the business model is a financially prudent route to yacht ownership. Atlantic Cruising Yachts has independent, certified financial planners who are experts in Business Yacht Ownership® and can meet with you to determine if your circumstances allow you to benefit. To get an initial understanding of how the business model works, sign up for one of our live Business Yacht Ownership® webinars. When it comes to purchasing the yacht of your dreams there are a multitude of decisions to make. Do you choose power or sail? Compact or large? Is it for personal enjoyment only or will it be placed into charter? 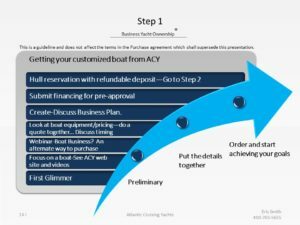 For yacht owners who utilize our innovative Business Yacht Ownership® program to significantly reduce the overall costs, placing their new vessel into charter is the nearly the final step of the process. With that in mind, the last question to answer is, where? Many owners select Sailing Florida Charters in St. Petersburg for the location’s year-long sunshine, thriving tourism economy, and experienced yacht maintenance specialists. Florida is known as the Sunshine State for a reason. 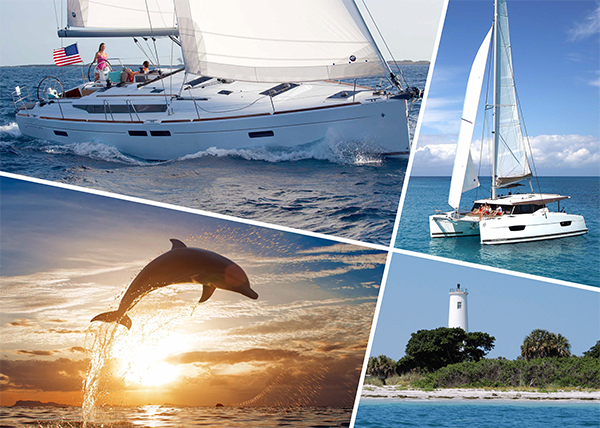 With about 361 days of sun per year, their guests have ample opportunity to enjoy chartering on your yacht.¹ Located on the Gulf Coast, St. Petersburg, Sailing Florida Charters is nestled on the Tampa Bay with quick access to the ocean. The location offers easy cruising to a multitude of attractions including the Skyway Bridge, the Dry Tortugas, Fort Jefferson, Marco Island, Key West, and more! It’s a charter destination that packs quite a lot of vacation opportunities for owners and guests alike. In 2017, Florida saw an all-time record of 116.5 million domestic and international visitors.² This year, there were over 33.2 million visitors in the first three months alone.³ Tourism has an incredible impact on St. Petersburg and the surrounding area’s economy, contributing $9.25 billion in annual spending and nearly 94,000 jobs.4 A thriving tourist economy translates to a profitable charter season for yacht owners. Vacationers are clearly seeking Florida’s year ‘round sunshine and warmth! If the unbeatable experience Florida offers vacationers isn’t enough to convince you that St. Petersburg is the place to put your yacht into charter, then consider how pristine your vessel will be kept. The dock hands and staff at Sailing Florida Charters boast a reputation for their extensive industry knowledge, passion for maintaining yachts, and love of the sea. The staff is able to provide guests with tips for the best local dining and shopping options, in addition to top-notch anchorage points out on the water. Their outstanding customer service and boutique experience offered by Waypoints® will have charter guests planning their next trip before they even return to the docks. 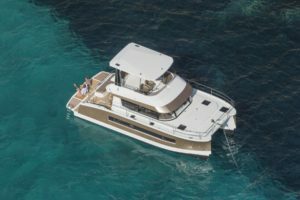 Interested in placing your new Jeanneau or Fountaine Pajot yacht into charter? Learn how you can become a part of the Waypoints® fleet by contacting Atlantic Cruising Yachts. Every buyer’s journey to yacht ownership is unique. Phil Hammar and his family’s journey began in 2007. At the time, they were not quite sure what type, brand, or features to explore. Their son was 18-months-old at the time, so the safety of a vessel was of the utmost importance. 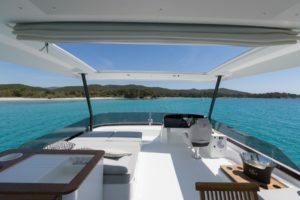 After looking into various brands, such as Beneteau and Catalina, they selected to purchase a Jeanneau Sun Odyssey 36i for its highly secure deck and its unquestionable craftsmanship. They christened their vessel Blue Cloud and enjoyed many day sailing trips throughout the Chesapeake Bay. Did You Miss Us In Miami? Here’s A Recap of What Went Down! The Miami International Boat Show was a huge success for the Atlantic Cruising Yachts team! 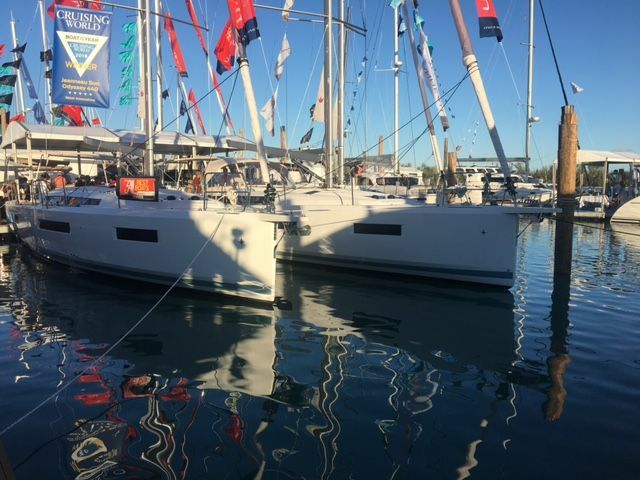 It took place February 15-19 at the Miami Marine Stadium Park & Basin, with eager guests touring the 11 models that were on display, including both Fountaine Pajot catamarans and Jeanneau monohulls. The weather was wonderful, and the show had a great turnout, seeing crowds well into the thousands. We were even lucky enough to deliver yachts to some of our incredible customers during the show!